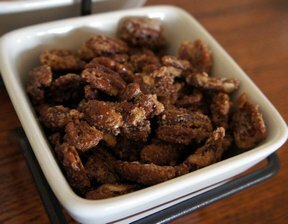 Sticky sugar coating around toasted pecans. Absolutely delicious warm out of the oven! 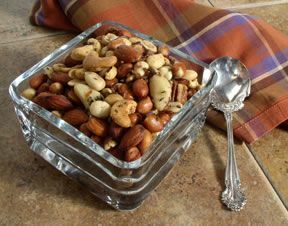 Perfect to much on as a snack or served on top of a green salad. Mix spices, salt and sugar. Whip egg whites and water until soft peaks form. 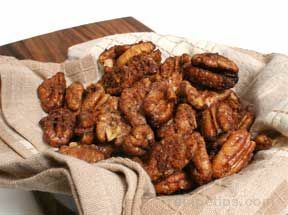 Fold pecans into egg whites to coat evenly. Slowly add sugar mix to coat. Grease cookie sheet and bake for 15 minutes. "I had to put half of these in the freezer so I wouldn't eat the whole bag. 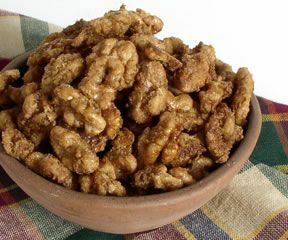 These were definitely irresistible!"